IACC, an apex bilateral chamber synergising India-US economic engagement, promotes travel and tourism with a spotlight on north Bengal & north east as a choice of favoured destination. The Indo American Chamber of Commerce (IACC) , organised the second series of conference after 2017 on September 20, 2018, in Kolkata, on ‘Prospect East- Expanding Perspectives’ to promote trade and commerce between US and India and conjectured about travel and tourism. The event witnessed around 200-250 delegates and was inaugurated by Patricia Hoffman, US Consul General in eastern India. Dignitaries like Prabir Dasgupta, regional and president, IACC, East India Council, Vasant Subramanyan, national president, IACC, Patti Hoffman, US Counsul General were present to discuss and boost both inbound and outbound tourism between India and the US. As for the past few years, trade barriers between both the countries have tightened, but the travel and tourism on a global prospect is still increasing. Tourism sector has become an economic sector contributing in jobs, exports, socio-economic activity, and cultural activity across all sectors. India is listed as number seven in the world in tourism sector as compared to its size, but it drops down to 97th in relative ranking when it is normalised with its population. “Travel and tourism being the key driver of growth in this contemporary world- United Nations was designated as International Year of Sustainable Tourism for Development in 2017. Therefore sustainable and development becomes crucial for the successful growth of tourism,” said Prabir Dasgupta, regional and president, IACC, East India Council. In 2017 more than one million Americans visited India and approximately 1.3 million Indians visited the United States. US being a treasure trove of many historical and cultural royal sites, towns and cities, national parks and beaches and the culinary delights, the US Consul General promotes the country as a perfect destination. “We want to see many more Indian travellers to create memories in the US,” said Hoffman. She supported to grow travel and tourism between India and the US and encouraged cultural exchanges between the two nations, B2B buyers, tour and travel operators, students, businessmen, and entrepreneurs seeking new technology, collaborations and tie-ups. 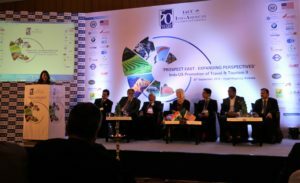 To enhance the outbound tourism on a large scale, the event saw sessions on US Visa, visit USA schemes, Airline connectivity, US attractions and impact of technology and financing packages to encourage tourism. As per the current projections of Indian tourism sector, approximately USD 380 million is to be generated by 2027. Tourism being a service based industry; it provides means to the people for rejuvenation, recreation, entertainment and education. Enriched with mountains, heritage, rich culture and beaches India is still lagging behind in the global market. “Incoming tourist is one of the most important thing being in the eastern part of India. With all its beauty, warm people and rich culture, we have so much to promote and so much to share with the rest of the world and also to promote domestic travels,” said Birgit Holm, general manager, Hyatt regency, Kolkata to Media India Group. Many panellists raised the need of highlighting the exotic offerings like terracotta handicrafts, wildlife sanctuaries, historical and cultural heritage to promote Bengal and north-east regions as an experiential and adventure tourism destination. Bengal being the gateway of eastern region, it has a huge potential for MICE, tourism and hospitality and can witness a huge growth in numbers. Switching over options for airports, the Pakyong airport in Sikkim enabled direct flights from Kolkata and ongoing operations of Bagdogra airport in the west of Siliguri has enabled a quantum jump in West Bengal tourism and Sikkim tourism. Keeping up the momentum a second airport at Kolkata is being planned by IAAI by 2020.